Why does my baby's eye constantly have tearing and goopy drainage? Many healthy young infants can have watery or ''mattery'' eyes. Parents often wonder if their baby has pinkeye or an eye infection. Actually, the usual cause is a small, blocked tear duct. It is not a bacterial infection and doesn't need antibiotic drops. Fortunately, it is harmless and won't affect the baby's eyes. It will resolve on its own with home treatment. Why are tear ducts important? 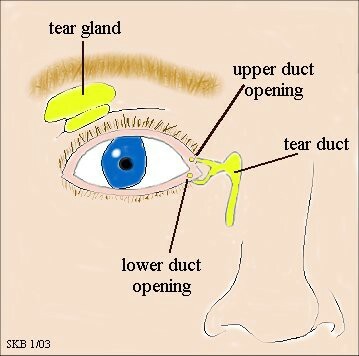 The tear gland (above the eye) produces tears to bathe and protect the eye. The tear duct (below the eye) drains away tears and debris to go. If the tear duct gets blocked or stopped up, there is no place for the tears and debris. The tears will start to run out over the eye, and the debris and mucus will begin to accumulate in the inside corner of the eye, forming mattery material. Why do babies' tear ducts get blocked? Babies, because they're small in general, have very small tear ducts. Also, anything that makes a baby's nose swell up--like lots of crying or a cold--will swell a tear duct closed. How can I unblock my baby's tear ducts? Fortunately, nothing has to be done, because leaving the eye alone isn't harmful. However, if the drainage bothers you, try the following. Applying warm, moist compresses over the eye and massaging the tear ducts can help open the tear duct. This has to be done several times a day until the baby grows big enough that his or her tear ducts enlarge on their own. If it is still a problem when the infant is over 12 months old, an ophthalmologist can surgically open the blocked duct, but this is very rarely needed. How can I tell if it is pinkeye? Pinkeye, also called conjunctivitis, is an infection of the lining of the eye. There is thick pus in the eye and eyelashes, and the white part of the eye will be red.